The Climbing program of the Alamo Area Council is dedicated to providing quality training and activities above and beyond the basic camping experiences of the Boy Scouts of America. We offer an adult Climbing Instructor course that includes both Tower training at McGimsey Scout Park and Real Rock training at Bear Creek Scout Camp. Individuals who satisfactorily demonstrate the skills, knowledge, and mindset necessary to be an instructor after completing the training will receive a Level I instructor card. The Climbing Instructor Course is offered twice a year during the Fall and the Spring. Check the UPCOMING EVENTS page and the council training calendar for the next available course. The Climbing Committee supports council wide events such as Freeze-O-Ree, Powderhorn, and Woodbadge. These are chances for you to have fun and talk to us about running a smooth event for your own Scouts. We offer two Open Climb opportunities at the Climbing Tower at McGimsey Scout Park per year, one in the Spring and one in the Fall. Scouts can attend either a morning or afternoon session at the tower and try out climbing for a nominal fee. This is a great way for a scout who has never climbed to try this great sport. Pre-registration is required for this event. Please check the UPCOMING EVENTS page and the council calendar for the next available course. 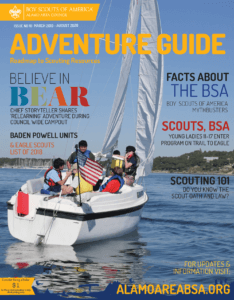 BSA’s “Climb on Safely” is available online in the e-learning section. This explains to unit leaders what they must do to properly plan a Climbing activity for their unit. The Climbing Committee is working on a Starter Pack with some recommendations to local gyms for you and your Scouts to try it out. In the meantime, the next best action to take is BECOME A BSA CLIMBING INSTRUCTOR! If your unit wants to go climbing we can train you. If you are interested in participating in the Climbing program or would just like some more information, please contact Climbing Team by email at Climbing@AlamoAreaBSA.org or, contact Committee Chair, Lynn Johnson .